The countdown to Christmas has begun - decorations are going up, there is tree lighting, card writing, cookie baking, planning and shopping going on. Each holiday season I tell myself there is no need for any new decorations but there always seems to something new being created. 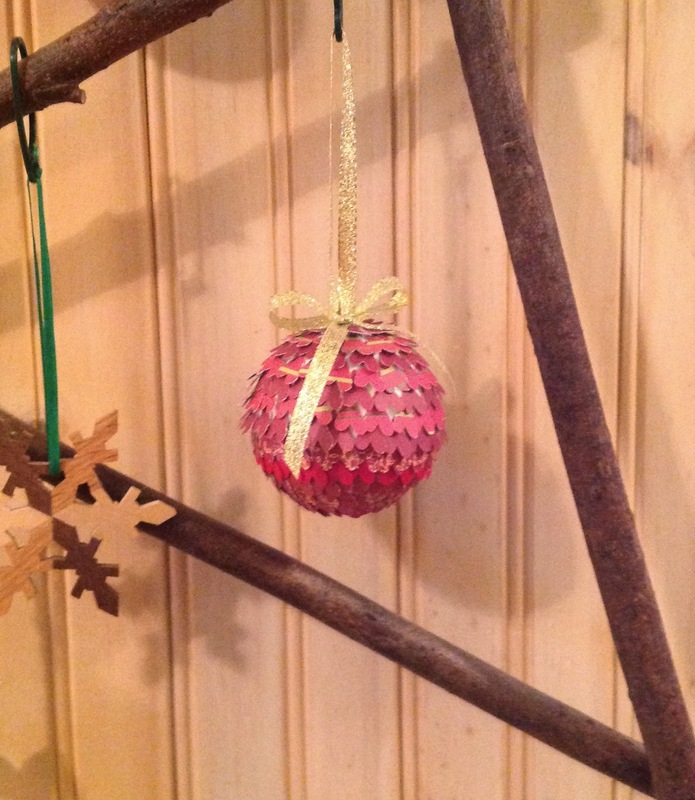 Here is a cute ornament idea using a Smoothfoam™ ball. To make this ornament, punch the primitive heart shape using a decorative punch and several solid and printed papers. Cut a length of ribbon for hanger and knot the cut ends. Drop a small bead of glue to the center of the ball, press the knotted end of the ribbon hanger onto the glue, press a straight pin into the knot and into the ball to secure. Dipping just the bottom tip of the punched hearts into a white glue, place the heart shapes around the ball. Start at the top and continue to work around in rows until the ball is completely covered. Add a bow to the top of the ornament. NOTE: Use other small punch shapes like a holly leaf that can be glued on in the same fashion or a snowflake that could be attached with pins. Do you have an ball ornament to share? If you do add it to the link along with all the others. See other ideas here with this link: Inlinkz or the Smoothfoam™ blog. "Creativity is inventing, experimenting, growing, taking risks, breaking rules, making mistakes and having fun." Visit Madeline Arendt's profile on Pinterest. This policy is valid from 25 October 2009 This blog is a personal blog written and edited by me. This blog does not accept any form of advertising, sponsorship, or paid insertions. This blog writes for its own purposes. However, it may be influenced by the writers background, occupation, religion, political affiliation or experience. Any compensation received will never influence the content, topics or posts made in this blog. The owner of this blog is not compensated to provide opinion on products, services, websites and various other topics. The views and opinions expressed on this blog are purely the blog owners. If the writer claims or appears to be expert on a certain topic, product or service area, the blog will only endorse products or services the writer believes, based on expertise or are worthy of such endorsement. Any product claim, statistic, quote or other representation about a product or service should be verified with the manufacturer or provider. This blog does not contain any content which might present a conflict of interest.